Remember when Luke Dahlhaus had dreadlocks? He was the Bulldogs cult hero who had x-factor but was inconsistent. That was three years ago and whilst he has maintained his cult hero status, Dahlhaus has since ditched the dreads and become an integral member of a team on the up. Although he had never been a bad Fantasy scorer, Dahlhaus, as is the case with many small forwards, struggled to find enough of the ball to really take his scoring to the next level. But the arrival of senior coach has seen Dahlhaus’ midfield minutes reach career highs. As you would expect, his Fantasy stocks have risen because of it. Coaches who started with him were left feeling like geniuses after round five with the pocket rocket notching up hundreds in all games. Then Dahlhaus copped a tag for one of the only times in his career which halted this run of triple figure scores. As all good Fantasy players do, he fired back, scoring 110, 113 and 113. By this time, people were starting to bring him in after resisting earlier on because of his previously un-proven Fantasy ability. Although he could manage just four tons in the remaining rounds, he still managed to finish the year with an average of 97 points, largely thanks to a scintillating first half of the season. ‘Dahl’ spent time as both a small forward and midfielder and continued to prove what a bargain he was after being selected with the 22nd pick of the 2010 Rookie Draft. He may be 14cm shorter than midfield teammate Marcus Bontempelli, but Dahlhaus is also extremely damaging whose constant pressure compliments the ‘rolls royce’ type players in Jackson Macrae and Bontempelli. On top of that, Dahlhaus is a quick thinker but still makes good decisions with ball in hand. He creates plenty of opportunities for others, has electrifying pace and the ability to tear open games. A product out of the Geelong Falcons footy factory, Dahlhaus impressively finished 13th in the league for contested possessions – a nice placement considering most of the contested ball players are tall, powerful bulls. Unfortunately Dahl hasn’t scored as many hundreds as last year but in saying that, he hasn’t really posted a dud score. Injury kept him sidelined for five weeks from rounds 13-18 however he has overcome that and returned to action for the past two weeks. The Bulldogs have Collingwood, Essendon and Fremantle in the final weeks and at the remarkably low price of $430,000, he could be a finals match winner. Like Dahlhaus, GWS’s Devon Smith is an exciting smaller player and like the majority of small forwards, has pace to burn. In recent years has become one of the premier players in his category. He is zippy but also very tough and doesn’t shy away from the physical side of the game. Smith was takem with pick 14 of the 2011 AFL Draft and has been a mainstay in the Giants team for effectively his entire career – until this year. He was rightly selected for the first three rounds but his numbers were down and he was consequently dropped for the clash with Port Adelaide. A good game in the NEAFL saw his immediately return against St.Kilda but he could manage just 16 disposals, 5 marks, 3 tackles, 1 goal and 69 Fantasy points. He then missed the next nine rounds before lining up in his sides disappointing loss to Collingwood at Spotless Stadium. Smith only collected 15 touches here and some would consider him lucky to not get dropped given the depth the leagues youngest side possess. The next week, GWS and indeed Devon Smith needed to find some form leading into the finals and that’s exactly what they did. Devon collected a season-high 26 disposals along with 5 marks, 5 tackles, 2 goals and 110 Fantasy points. After this score, it was just as important that he backed it up and started to gather momentum. Although he didn’t ton up, Smith still managed 23 possessions and 2 goals on his way to 94 points. In GWS’ crushing recent victory of Richmond, Smith’s pressuring and energy around the ball were vital. He finished with 14 tackles and 105 points. This performance was particularly good because it showed he didn’t have to rely purely on goals to score well. Last week he scored 93 points but that could’ve been improved upon if he had turned his three blemishes into majors. Devon has scored just two hundreds and has spent a lengthy amont of time on the sidelines, so why should he be considered in Fantasy at this late point in the year? Well, he averaged 94 in 2014 and 85 in 2015 so he has proven to be an above average Fantasy player. The Giants face West Coast this week who have conceded the most points of the top eight sides in the past month. They then play Fremantle who have simply had a horrible season. Expect a decent score. They wrap up the home and away season with a trip to Etihad Stadium where they will play North Melbourne who have been the most restrictive side over the past four weeks. The Freo game stands out but I’d be hoping for decent scores in the other two games as well. Smith has a three round average of 97 and is priced at $429,000. Bargain, right? Verdict: Luke Dahlhaus and Devon Smith are very similar players. They are both small in stature but are tough, hard at it and have an eye for the goals. Luke and Devn have the potential to go into the midfield when needed and can provide x-factor and pace around the ball. For me, it has to be Dahlhaus though. Last year he proved to be a quality Fantasy scorer and is the hottest bargain going around at the moment. Smith is a bit too inconsistent and unproven for this stage of the year. As a general rule, ruckman play their best football as they edge closer to 30 years of age. As a result of this, many top ruckman were either picked up later in the national draft or in some cases, the rookie draft. It’s rare to see clubs use a first round pick on a young ruck. However that’s exactly what Collingwood did in 2012. They also picked up smaller players in Ben Kennedy and Tim Broomhead but Grundy has proven to be the best pick of the three. Grundy is a physical player who is damaging around the stoppages and as a marking tall forward. He is physically advanced for his age and impressed recruiting staff at the draft combine with his skills, clean hands and mobility. The club showed tremendous faith in Grundy when he shouldered the lone ruck role in his debut season. Despite heavy pressure applied from the seasoned Darren Jolly and 209cm Jarrod Witts, Brodie managed to maintain his spot. Grundy averaged 70 and 60 in his opening two years from six and fifteen games respectively. He then announced himself as a viable Fantasy option by averaging 91 last season in yet another example of the third year breakout. This time around, Grundy has improved yet again and is well and truly classed as a premium ruck option. He missed the opening game of the season but scored back-to-back 91’s when he opened his 2016 account. He notched his first hundred of the campaign against Melbourne and in particular Max Gawn. This came from 23 disposals, 4 marks, 5 tackles and 25 hit-outs. He then scored 92 and 82 against Essendon and West Coast. However against Matthew Kreuzer, he struggled to get his hands on the ball and managed just 54 Fantasy points form 6 touches. That remains his lowest score of the season. In the next 12 rounds, Grundy managed no score under 80 and scored seven tons including hauls of 119, 134 and 127. So far this year, he is up on his career averages in disposals, marks, tackles, hit-outs, goals and Fantasy points. He has also achieved career best statistical highlights in all major areas except for tackles. His best ever Fantasy score came against Adelaide where he went head-to-head with Sam Jacobs and recorded 134 Fantasy points. Perhaps his most dominant game to date came in against West Coast in round 19 where he racked up a whopping 45 hit-outs. Grundy has all the attributes to become the best ruckman in the league, in my opinion. His tap-work has always been solid whilst his mobility allows him to find plenty of the ball. An excellent, safe option at $534,000. From a player who is looking to become the top ruckman to the man who just so happens to hold that mantle. Todd Goldstein is a very, very good player. After numerous seasons averaging around the 80 point mark, in 2015 Goldstein set a new benchmark for all other big men to aspire towards. He was by far the best of his kind in the league and averaged a cool 113 Fantasy points. As a result, Goldy was the second highest priced player, behind Stefan Martin by the slightest of margins. This record-breaking season didn’t go unoticed though as he was selected in the All-Australian team for the first time. He also took out the Syd Barker Medal as the Kangaroos best and fairest player. It’s hard to believe Goldy only enlisted for TAC Cup side Oakleigh just days before the season was due to commence after previously focusing on his other talent – basketball. That season with Oakleigh went very well indeed and the icing on the cake came when North Melbourne selected the 201cm giant with pick 37 of the 2006 National Draft. What a bargain that has proven to be! This year he has dropped off as expected but is still averaging 98 points. At half time in the ‘Roos round 1 match against Adelaide, things weren’t looking too good for Goldy as he had touched the ball just four times. A sensational second half ensured he finished on 121 points thanks to 13 disposals, 4 marks, 7 tackles, 44 hit-outs and 1 goal. Many coaches elected to head into the season with the double trouble ruck combo of Martin and Goldy. The pair locked horns in round 2 and although it was Goldy who won more hit-outs, Martin had a greater impact around the ground. I would love to know how a player kicks five majors and scores 149 Fantasy points yet still manages to arguably come off second best in a head-to-head encounter. Well, that’s exactly what happened down at Hobart in round 3. Goldstein kicked three goals in a superb first half but Gawn dominating in the air – finishing the game with 63 hit-outs. Goldy was consistent over the next seven weeks and managed to put in some mammoth hit-out numbers including 45, 40, 45 and 43. He then missed the match against Richmond with a slight knee complaint. That game also happened to be played in his happy hunting ground of Tasmania. The complaint hasn’t resurfaced since and Goldy has managed hit-out counts of 38, 39, 42, 65, 30, 21, 36 and 35. He truly is the premier ruckman and although the likes of Grundy and Gawn may have scored just as well, you will struggles to find Goldstein priced at $463,000 or lower in the near future. He has had just two games with double-figure numbers in the kicks column but he lays tackles, bobs up for the odd goal and racks up enormous amounts of hit-outs. Lock him in for next year if his price remains at this level. Verdict: Brodie Grundy and Todd Goldstein have endured strange years. It has been apparent for a number of weeks now, that Goldy is carrying a niggle. Goldstein is averaging 99 points compared to Grundy’s 97 however the former’s price has plummeted as the latter’s continues its assent. Along with max Gawn, the pair are probably the best ruckman in the competition however I prefer Goldy here – how could you resist him for $71,000 less? Carlton’s best two players this year have been defenders. Of course I’m talking about Sam Docherty and Kade Simpson. Whilst Docherty is young and still improving, Simpson has long been one of Carlton’s strongest and most consistent performers. He is skinny but fearless in his approach. The Blues vice-captain finish last season ranked number one at the club for running bounces. A rebounding role across the half back line is the primary reason for this. Simpson was taken with pick 45 of the 2002 National Draft and made his debut in round 11 of 2003. 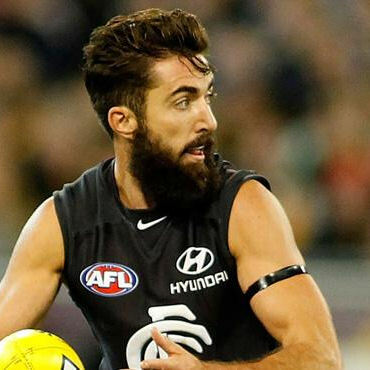 Simmo has not only been a star for Carlton, but is also one of the best Fantasy defenders. He has featured in all 22 games of a season eight times. You’ll struggle to find a defender who has been more durable and consistent throughout his career. Simpson has averaged over 80 nine times and will almost certainly make that ten as he is currently going at 98 points per game. At the age of 32, Simmo is arguable playing his best football and started his 216 campaign with a big 118 point showing against Richmond. He positioned himself well, provided run and carry off half-back and is an excellent example of how to play the rebounding role. He had 25 disposals, 9 marks, 1 tackle and 96 points against Sydney the following week and although his kicks were at times wayward, in true fashion he never stopped trying. By now you’d expect that opposition teams would look to curb the influence of Simpson and that’s exactly what Gold Coast did in round 3. Simpson still managed 23 disposals but was down on his usual output, scoring just 57 Fantasy points. In hindsight, if he had scored better in this game perhaps his average would’ve pushed into the three figures. Against the Bulldogs, Dockers and Bombers, Kade notched up two hundreds and was influential in kick starting the Blues season. From round 7 to 14, Simpson collected 20+ disposals in all games and had a low score of 96 points. Coincidentally, Carlton won four games in the period. Unfortunately for their supporters, the team hasn’t won a game since the 38 point victory over Brisbane in week 11. However Simpson’s scores have remained high, as has his Fantasy value. Although he scored 67 against Hawthorn, in the two weeks either side of that, Simpson has scored 120 and most recently 135. He is pretty much guaranteed to notch up 20+ touches every game and hundreds should be expected in the remaining three games against Brisbane, Melbourne and Essendon. Rory Laird would have to be well and truly in the mix for All-Australian this year despite missing five games through toe and hip injuries. Lairdy is tough, much like Simpson and is certainly one of, if not the best small defender in the league. Last year, Laird was required to step into a rebounding role after Matthew Jaensch was sidelined with a severe knee injury which eventually led to his retirement. In round 1 against North Melbourne, Laird worked tirelessly, was one of the Crows best and finished the game with 90 Fantasy points. Some coaches questioned whether the off-season acquisitions of Paul Seedsman and Curtly Hampton would lead to Lairdy returning to his lock-down role in the Crows defence. This proved to be wrong and those same coaches were left kicking themselves as Laird carved up the Power in the round 2 showdown. He seemed to be everywhere and was perhaps unlucky to miss out on the Showdown Medal. Rory finished the game with 33 disposals, 12 marks, 3 tackles, 1 goal and 136 Fantasy points in a massive effort. Laird scored 76, 88, 89 and 81 in the next month of games and although the scores weren’t as high as they previously had been, he continued to put a strong case forward for the competitions leading small defender. After playing just 63% TOG in the clash with Fremantle, Laird bruised his toe which prevented him from playing for the next four matches – of which three happened to be against top eight sides. He returned in round 11 with a lower ownership but produced more of the same. He finished the game with a casual 30 touches and 96 Fantasy points. But in the past seven games, Laird has exploded. First he collected 10 marks and 115 points in Adelaide’s emphatic victory over West Coast. The week after he was slightly down on productivity but his courageous mark coming back with the flight of the ball was a typical action performed by the tough-as-nails, nuggety defender. His intercept marking and productivity was on show against Melbourne and Carlton. He also managed another two tons. Although he tried hard, the trip to Geelong in round 18 was always going to prove a difficult hurdle. With that being said he still scored 86 after a 9 disposals first quarter. Against the bottom two sides, Laird and indeed the Crows, have proved far too good. He scored 107 and 110, was dominant and continues to amass big numbers. Laird’s productivity has even led some teams to play a defensive forward role on him. Laird wins plenty of his own ball but is rarely beaten and almost always restricts his direct opponents. A great Fantasy option and is getting close to a lock. Verdict: Two premium defenders here and two players who are expected to feature come All-Australian night. They are two of the leading options down back and are both similar in their style. Simpson is a different build to the nuggety Laird but is just as tough. Simpson is a better kick than Laird but Rory is currently in a rich vein of form which as seen him produce midfielder-like numbers. Both are in terrific form and you should be looking to finish the year with at least one of them. I would go for Simpson just ahead of Laird though. Get rid of Vince or Hodge? I’d only ditch Hodge for Simpson, Docherty or Laird and only if he is your biggest problem. Keep. They have a primo run home. There has to be something else you could do to improve your team? It is literally a coin toss. Titch and Parker could yield the bigger reward, Kennedy is points in the bank every week. My backline consists of Shaw,Docherty,Simpson,Laird,Boyd and Collins. Who is the next best backman to finalise my defence ? Houli or Bartel has a good run home maybe? Any cheap defenders getting a game this week ? Same question I’ve been asking, who do I get rid of out of Vince, Bartel, Shaw or Hodge for Simpson? I already have Simpson, but out of that bunch I’m going Vince to Docherty. Gotta stop the bleeding! Can’t split Sloane and JPK. Yes that other 67 was previous to this years 67…. Any thoughts would really be appreciated!! Which forward to pick up out of hall, montagna or dalhaus? I brought in Dalhaus for Hall last week by necessity. I’d be watching Hall this week if I were you, not bringing him in. He could get injured again. Trade or keep Sam Mitchell? For the last two games, who are the top 6 defenders you would choose to have, in order of preference ?